Colombia Archives - ITB Travels! What can I say? I pulled it off! A girlfriends’ trip to Cartagena. I got nine girlfriends to get together and take a short, but amazing trip from Washington, DC to Cartagena, Colombia. Nine busy women, who have careers, husbands/mates, children, parents, and pets, all said “Yes!” three months ago, and all followed through. Times like these remind me of how very special my life is, and I am grateful. Leading up to my milestone birthday, my best BFFs asked me how I wanted us all to celebrate. Since they know that I live to travel, they knew a trip was in order. 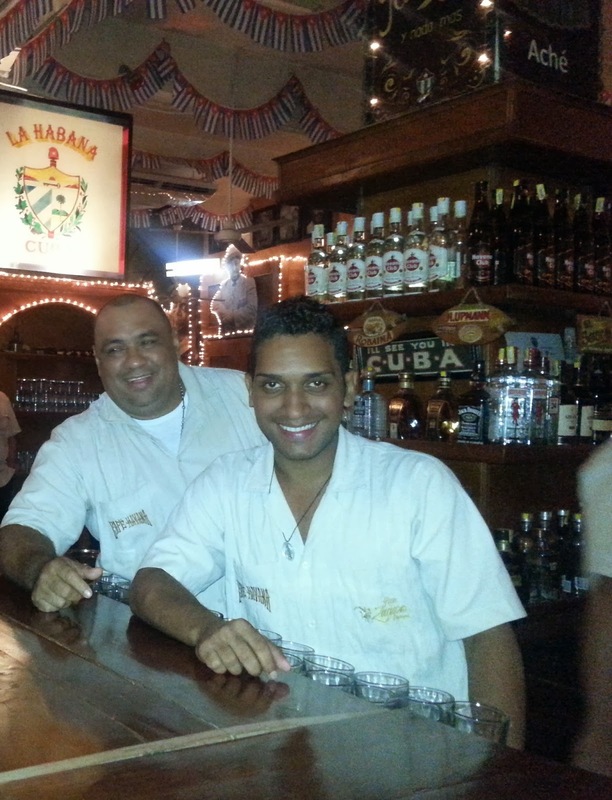 They probably weren’t even surprised when I said that I wanted us to celebrate in Cartagena. I think, though, almost all of us were surprised that we were able to make it happen. But, with a couple of minor tweaks on the dates, and adding a new friend to our party about three weeks before the big day, we set off on our adventure. We took a 7 am flight out of Baltimore/Washington International Thurgood Marshall Airport , connected through Fort Lauderdale, and arrived at Rafael Núñez International Airport by 2:30 pm. Most of us slept through the first leg of the trip, so our 2 hour layover at FLL got the party started. As we gathered at the bar close to our gate, we had quick salads, sandwiches, snacks, and then…Prosecco. We were so excited to see that the airport bar carried our favorite…splits of La Marca. As we enjoyed a couple of rounds, strangers came up and asked what we were celebrating, where we were going, and offered to take group pictures for us. It was almost like our excitement was contagious. 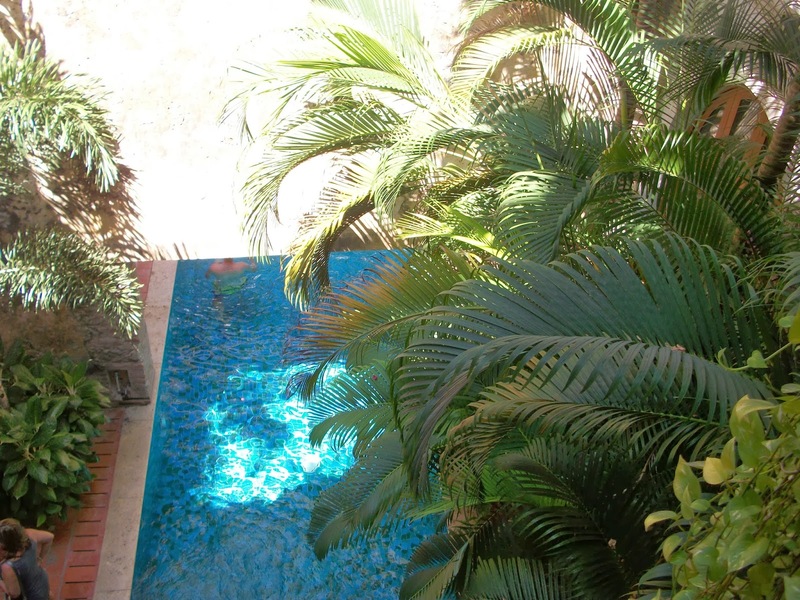 Our early morning flights had us running on fumes, and we were pretty beat when we arrived in Cartagena. As a result, I could see some of the action-packed adventures that I had planned for our first evening fading away. I totally understood. Laura of Gema Tours, was waiting for us as we cleared customs. Her team quickly loaded our luggage into the mini-bus. We excitedly started on the 15 minute ride to the Intercontinental Hotel. After a check-in, we made quick wardrobe changes (it was a sunny 93 degrees F), and met in the lobby. We walked to Kokorico, for a late lunch of roasted chicken, fried chicken, yucca, and arepas. One at a time, we placed our orders at the register. We sat and enjoyed how cool it was to see that at this fast-food restaurant, they have servers. They delivered our silverware, soft drinks, napkins, and gloves (for eating the fried chicken!). While the wait was a bit longer than we are used to at a fast-food restaurant (about 25 minutes), we agreed the outcome was well worth it. Hot, juicy, delicious chicken made to order! After our late lunch, we attempted to walk off the ton of food we’d just eaten. I’d planned for us to go back to the hotel, nap, and get get dressed for dinner and dancing. Instead, we walked a few more blocks, reached the beach, and answered the call of the tiki hut servers to come, sit and have cocktails. With the waves splashing and the sun setting as a backdrop, we soon realized this was probably not a bad decision. A couple of local “musicians” sang songs for us, a stray beach dog slept at our feet, and growled at anyone that came near us. We sat happily, lazily, and decided that this was pretty much how our first day in Cartagena was going to wind down. After a couple hours, we headed back to our hotel. There was a huge party about to take over the bar and rooftop pool deck. The hotel manager stopped us as we headed to the elevators. She offered us 2 for 1 nightcaps, and our own private section of the rooftop pool area. Who could turn that down? Finally, after a couple more hours, we turned in. In addition to being totally wiped out now, we had an 8 am pick-up the next day for out trip to Isla de Rosario, and we wanted to be ready. Getting There ~ Jetblue had the best flights for us from the Washington, DC area airports. Stay ~ We enjoyed our stay at InterContinental Cartagena de Indias in Bocagrande. Located in the midst of everything, and across the street from the beach, it looks just like it’s website pics! 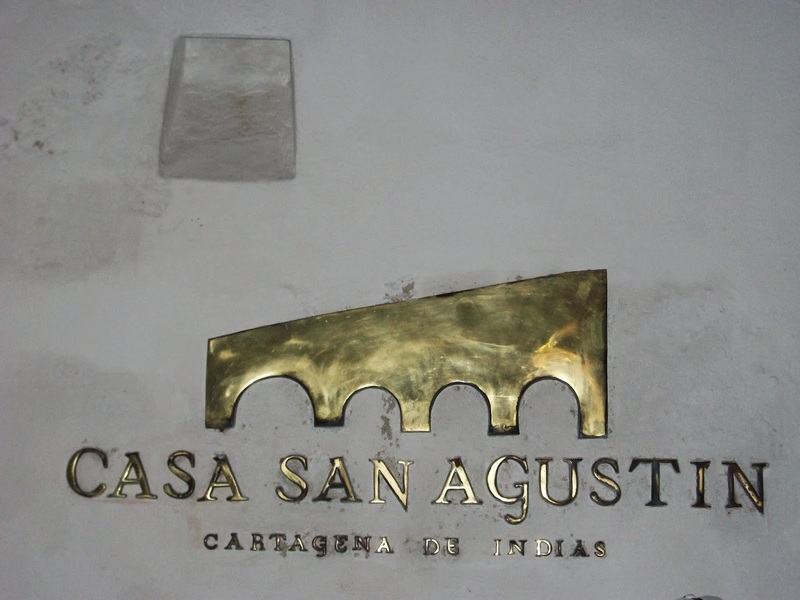 If you’d rather stay in the Walled City (Old City), definitely consider the beautiful, stately, Hotel Casa San Agustin. Getting Around ~ I suggest making airport/port transfers, and excursion arrangements with Gema Tours and Holidays With Downtown (ask for Rosa or Claudia). Taxis are great to get around town. The 9 of us typically used 3 mini-cabs to get to and from dinner and dancing. Approx. 10 Colombian COP from Bocagrande to The Walled City. Currency ~ The official currency is the Colombian Peso (COP). 2859.85 COP equals $1 USD. The preferred currency is the COP, so change money. 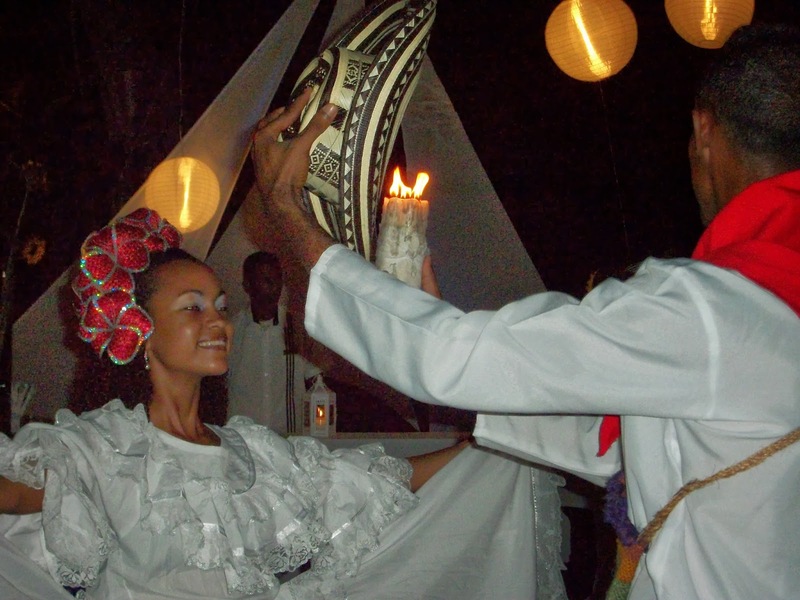 Credit and Debit Cards ~ U.S. credit and debit cards are widely accepted in Cartagena. Be sure to let your home bank know that you are traveling. Weather ~ While we were there last week (early February), the average high was 90 degrees F, and the average low was 76 degrees F. It was very sunny. I strongly recommend sunblock and a hat. The people of Cartagena beam with amazing, seemingly contagious, pride for their city, and with one visit you’ll understand why. The famous liberator, Simon Bolivar, called it The Brave City after 2,200 Spanish troops defended it against a fleet of over 150 ships and 33,000 soldiers. Today’s citizens can be found pleasantly strolling through the Old City, tending to their day-to-day lives, in this UNESCO historic centre, while thousands of visitors wander through in awe of the beautiful, vibrant colored buildings, the breath-taking architecture, the exotic costumes, the sounds of Cumbia, the glistening sun and the year-round tropical heat. 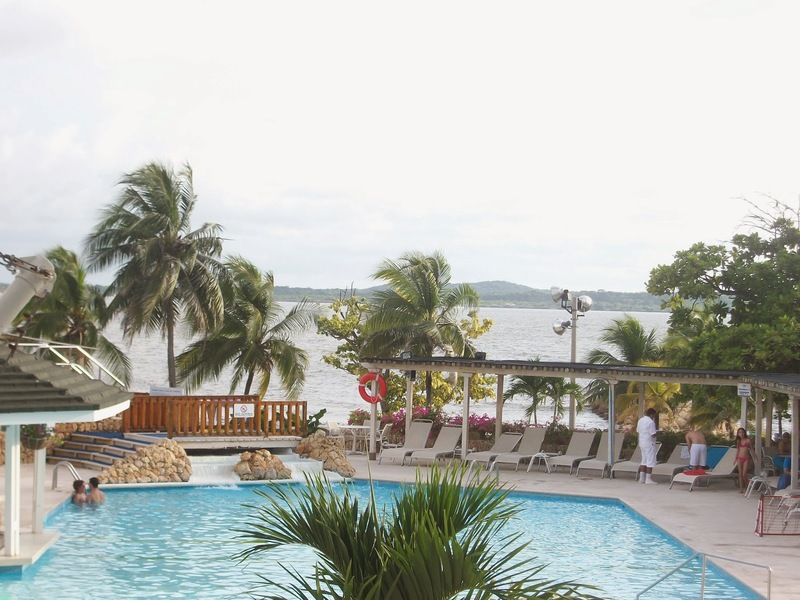 It is this very charm, almost a calling, that has led Travelingwrite and many, many others to stand back and take into serious consideration stepping away from the life of “9-5” and heading to a life on this amazing Caribbean coast. Just before entering the walled city, you’ll see the modern addition of the Convention Center on the marina. Upon entering the city, you are met with the beauty of the clock tower, a statue of Pedro de Heredia, who founded the the city in 1533, and the alluring scent of coffee and cocada. There are many sites to take in. Parque de Bolivar and Museo de la Inquisicion, to name a couple. With lots of lovely, high-end jewelry stores selling beautiful emeralds, and many more street vendors and artists peddling their wears, you are bound to find the perfect gift(s) to take along with you. Stop by and check out the water color paintings. This time we got beautiful finds from the artist himself, Wilson Noel. Hmmmmm…we can’t figure out how she does it, can you? 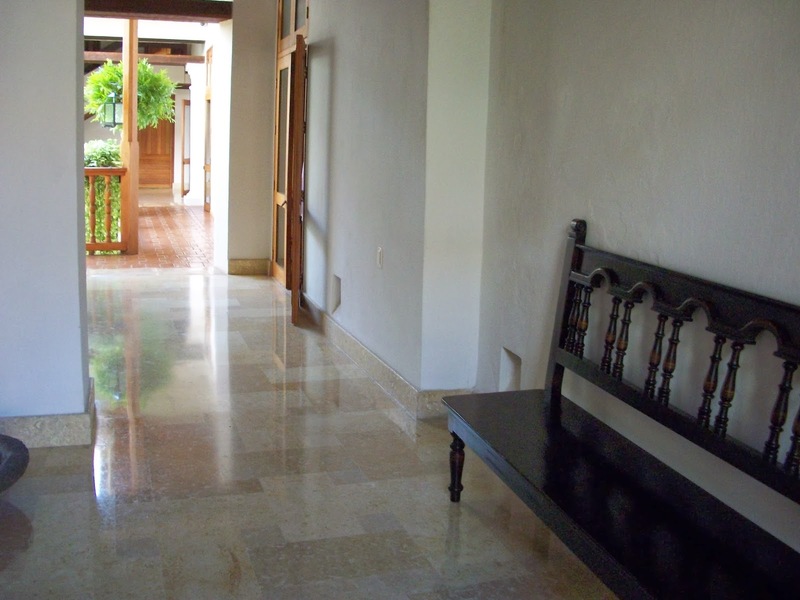 Hotel Casa San Agustin is pure luxury. 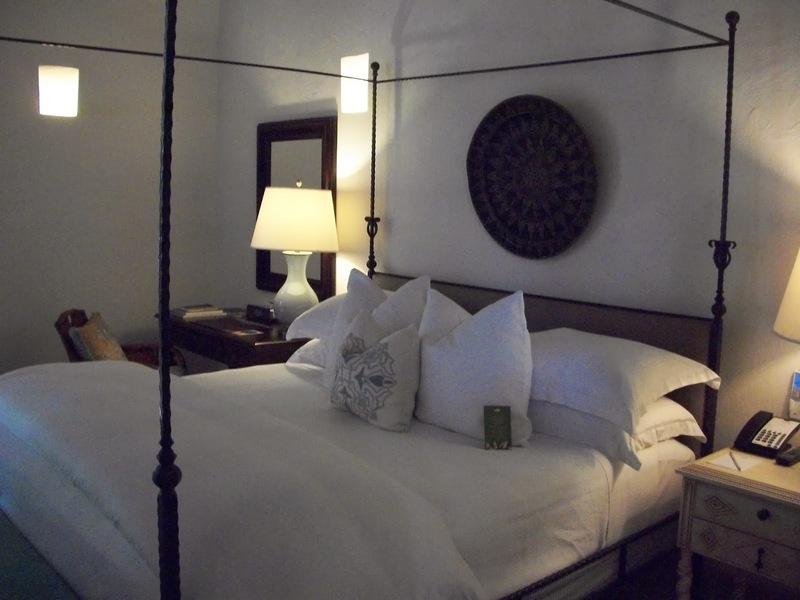 Located within the walled Old City of Cartagena, Colombia, this 24-guestroom, 8-suite boutique hotel is absolutely breathtaking! 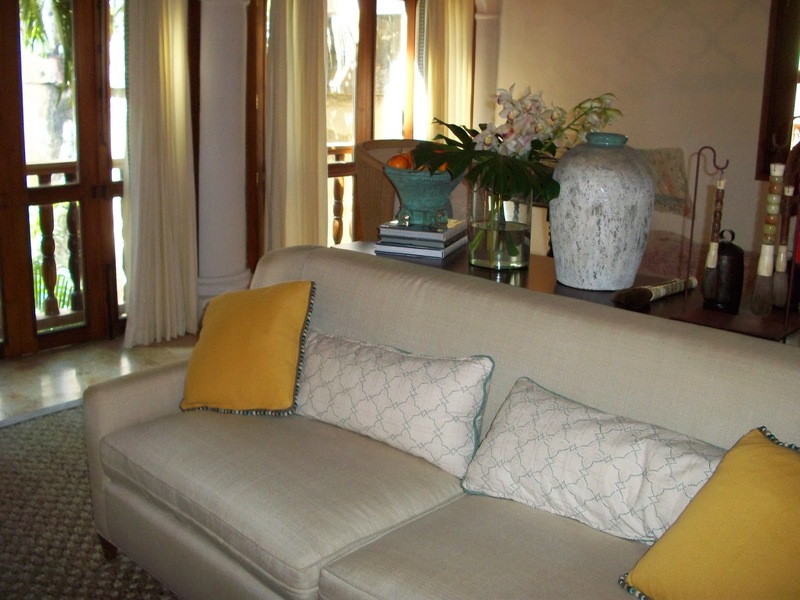 While restored to boast a chic, contemporary style, it still manages to exude a colonial-era, 17th century Spanish feel. With Caribbean Sea-inspired walls, each guestroom exceeds the desires of the modern traveler. From luxurious Frette linens, to Ortigia bath and shower amenities, to the chandeliers, sconces and ironwork beds that are works of art commissioned by local artists, no stone is left unturned. 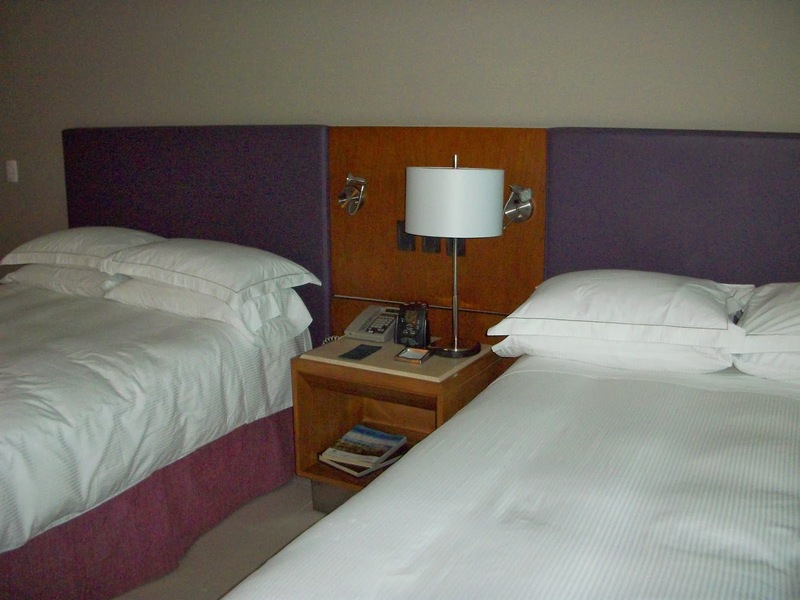 Some guestrooms even offer private pools or Jacuzzis. Executive Chef Cristhian Rusinque’s passion and creativity is showcased at the sophisticated, full-service Alma Restaurant! You can enjoy everything from Colombian-style bouillabaisse, to freshly-caught seafood, to dry-aged beef, all full of robust, tantalizing Latin flavor! 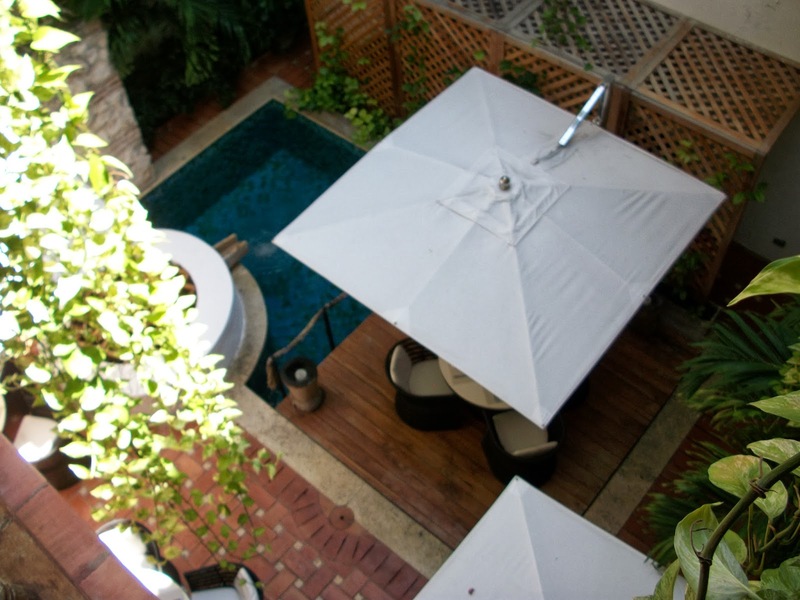 Whether traveling for business or pleasure, for a romantic dinner, or a group event, Hotel Casa San Agustin and Alma Restaurant should be at the top of your list when in Cartagena, Colombia. Having checked into the lovely Hilton Cartagena so early in the morning, my plan was to take a long nap in preparation for the evening. 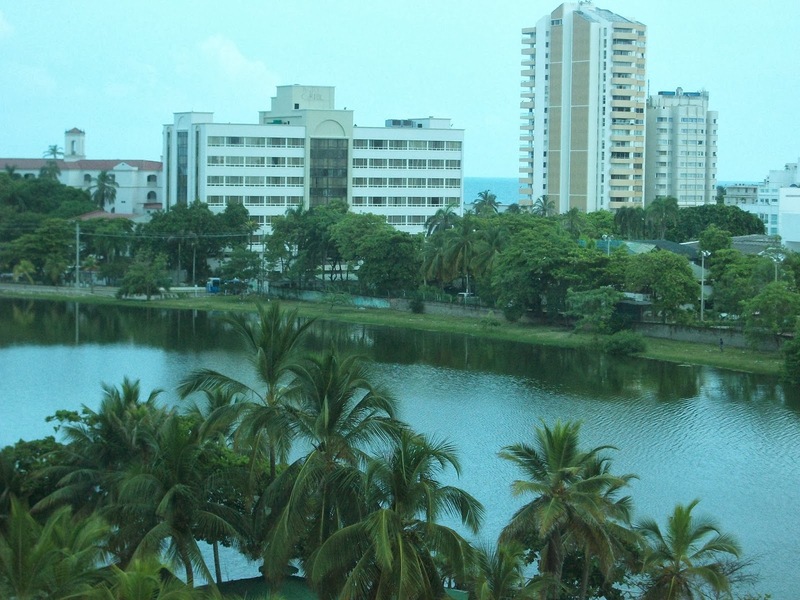 Once I looked out my room window, overlooking the beautiful lagoon, that plan changed. I didn’t want to miss a single moment here! So, I got myself ready and hit the beach. I looked for a sports bar that was showing college football, to no avail. I did find a few nice waterfront spots, though. So, I settled on one, pulled up a seat and enjoyed lemon-garlic prawns, rice and an Aguila Light beer…or 3. After a few hours of beach bar lounging, I headed back to the Hilton and got ready for a night out on the town. The partying began with a cocktail party on the Hilton terrace, complete with traditional Colombian dancers, followed a long night of live music, Salsa dancing and rum (Habana Club rum, that is!) 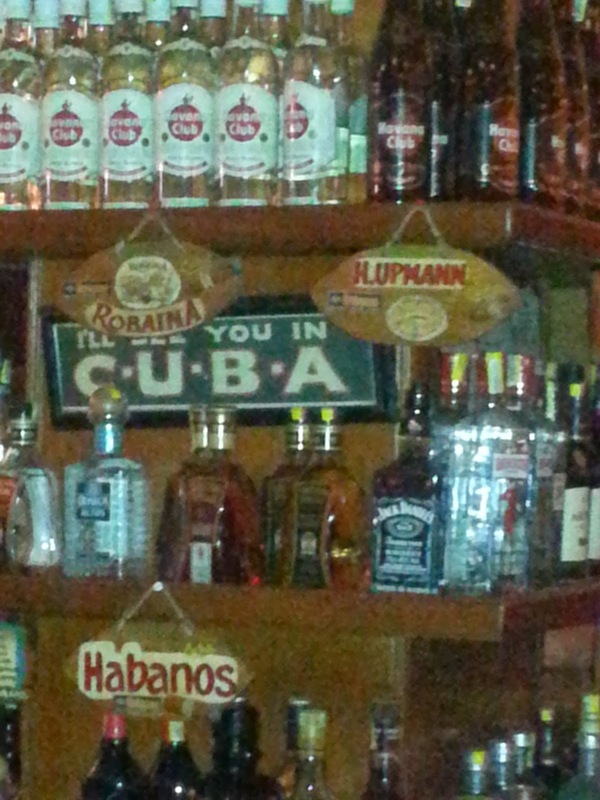 at Cafe Havana. What a night! 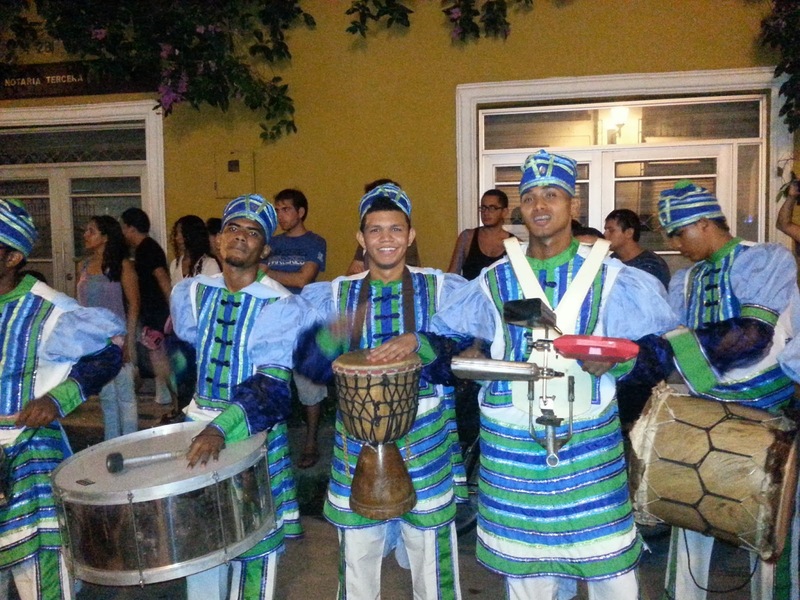 Immediately upon arrival to Cartagena, Colombia, you can’t help but notice the hustle and bustle. For a fairly small coastal town, they are so full of life! I arrived at 7:45 Saturday morning. I had been traveling for a couple of days, so I easily lost track of what day it was. I had to confirm with my happy (really happy) driver that it was indeed Saturday. Saturday morning. The airport (small and cozy, just as I remembered) was really busy. We de-planed and walked the outside corridor to the terminal. No bags checked for me, of course. I headed through the airport and outside, and saw my name on one of the waiting name cards held by my happy driver. As I stepped outside to the front of the airport, I could feel the happiness and festivities in the air…at 7:55am now. We took the 10 minute, beautiful car ride down the ocean-front to my hotel, the Hilton Cartagena, and I have to say, I could have taken another hour of this ride. At every corner I noticed sights that were even more interesting than my last visit here (in January). Some people waiting on rides to work, some people walking to their local jobs, some people running errands, some people headed to fish, some people just hanging around. It was busy. Very, very busy. And hot. Very, very hot. It’s winter in Cartagena now. Winter in Cartagena means its raining most of the time. We’ll see about that! In the meantime, I get a glimpse of the up and coming new hotels, resorts and condos. Lovely! I am so looking forward to my stay in one of my new favorite cities! 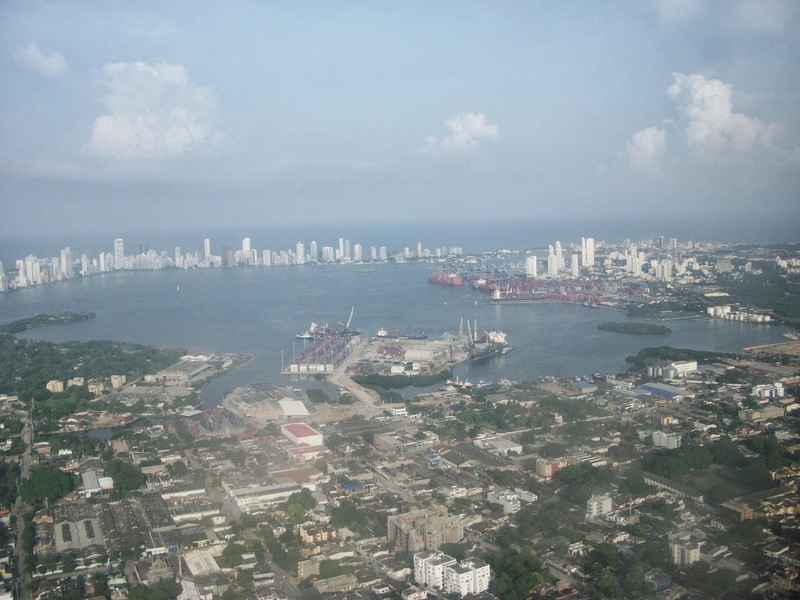 I took my second and most recent trip to Cartagena, Colombia on Avianca Airlines, traveling from Washington, D.C., connecting in Bogota. 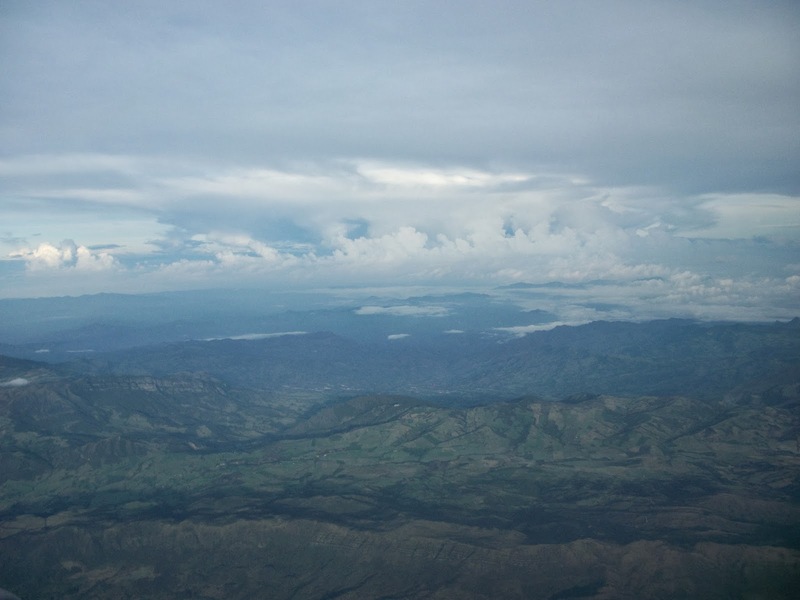 This route presented plenty of positives…I was able to spend a day and night in Bogota for the first time, I became introduced to Avianca Airlines (Love it! 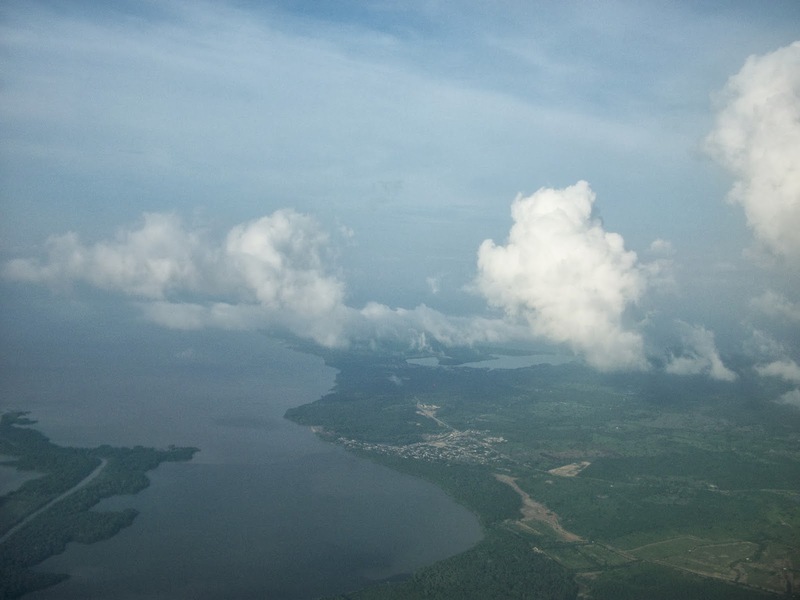 ), and I flew into Cartagena in the morning and had a pretty clear view of the mountains and shoreline along the way. While my stay in Bogota was brief, I was able to see that while there is a definite difference in the weather climate, the people are just as warm, friendly and helpful in Bogota as they are in Cartagena. I was happy to have dressed in layers. It was pretty chilly. But, this bustling city of over 6 million people was so full of energy that I didn’t give it a second thought. I will definitely go back soon to spend more time getting to know this city! My 7:00am flight to Cartagena presented these breathtaking views of the mountains and shoreline. For as long as I can remember I have yearned to spend time in a foreign country. I’m not talking about a couple of weeks. I mean real time. Like, at least a year. Now that I have finally mustered up the guts to do it, I’m beginning to feel a little overwhelmed. While I made my decision to take the plunge about 3 1/2 months ago, I feel like only now is it sinking in that I have a lot of “stuff” to take care of during my next 3 months here in my hometown of Washington, D.C. before I head out on my journey. Grant it, once I made my decision, I did begin job searching, climate researching, and home hunting, it now appears to me that the downside of having the answers and details lined up so much in advance, creates way too many choices. For instance, which end of the beach would I like to live on? Do I really want to live on the beach, or should I save a few pesos and live inland? Do I want to purchase a scooter right away, or should I take public transportation for the first few moths to get the lay of the land, er, roads? Typically when I travel, I don’t put too much time and thought into my packing. Just the basics. That’s all I take. Often times, the basics include goodies for the locals if I’ll be venturing off the beaten path (which is almost always!) and have learned that the locals would love to get there hands on something that I can easily provide (pencils and pens in Kenya and Tanzania, children’s clothes and books in Nicaragua, toiletries and blue jeans most everywhere outside of the capital city in Central America and the Caribbean, to name a few). However, packing for a 12 month trip is something totally different. Whew! Altogether different! But, I’m going to do my best to make it as simple as possible. I am planning to head South with a backpack, a carry-on, and one checked bag. I can do it! I’ll just have to put a little more time and thought into my packing this time. So, the difficult part is over. I’ve let my parents and sister know about my move, and have given them plenty of time to question my decision, poo-poo my decision, embrace my decision, and finally want “in” on my decision. While I do have a couple friends who have chosen to spend my remaining 3 months here greeting me with “I won’t believe you’re moving away until you actually do it” (I don’t understand the disbelief. The last time I said I was moving away, I did it! ), vs talking to me about and asking me questions to learn more about my move, for the most part, my support system is in place. I’m over the moon with excitement. I’m a little nervous. But for the most part, I have to figure out what I’m packing!